Hello Peeps, so I know I have been AWOL of late due to a combo of things (Life, work, travels etc) and have neglected this space, so please forgive me whilst I catch up! Now that things have calmed down a bit, I plan on spending more time on here sharing with you all the things I hold dear – this has previously just been mostly plant based recipes, but I also plan on showing you what I have been up to lately. I have been able to travel quite a bit this year and I have seen some amazing places. I also plan on talking about my experiences of late with veganism, health, fitness and a few other topics so stay tuned!!!! Being a very busy person (as most people are! ), I often struggle with veganism sometimes in that it is not always easy to eat healthy on the go. Many vegan options in supermarkets are ok if you are stuck, but I find that they are often laced with unnecessary additives such as excess oils, salt, stabilisers etc. I needed some recipes for lunch at work that I could throw together quickly in the morning if I didn’t have time the night before, but that was also very filling, nutritious and delicious. These soups are my go to lunches, particularly on a cold day when I fancy something warm and hearty. Taking only 10 minutes to make (Including prep! ), they can offer something far more filling and nutritious rather than grabbing a sandwich at my local deli. Handy note: this is a very forgiving recipe – you can put it on to cook, go get ready for work or do the dishes and come back to it. It doesn’t matter really if the broccoli is barely tender or very tender – it all gets blended anyways! Chop Broccoli into florets (the smaller you cut them, the quicker they will cook). They don’t have to be perfect sizes as they will be blended anyway. 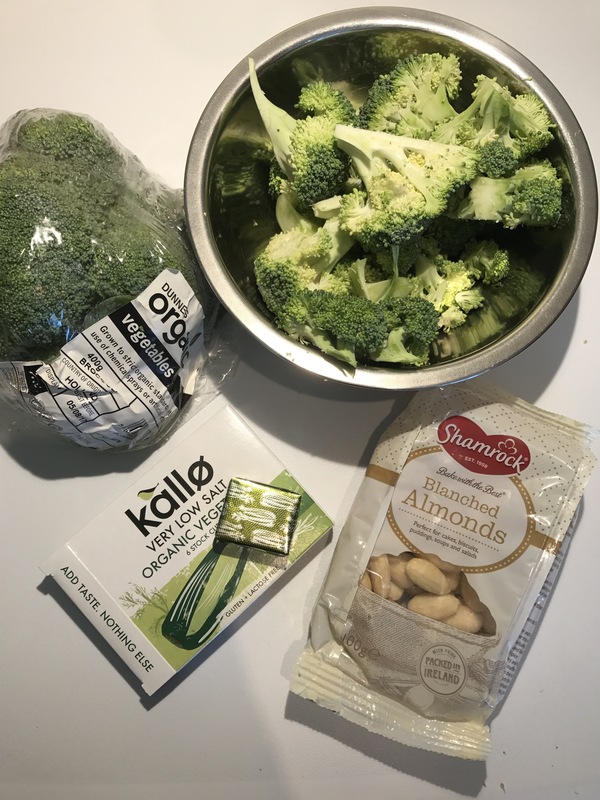 Put the broccoli and almonds into a saucepan. Pour enough boiling water in to just barely cover the broccoli. Cook on medium to high heat for about 5 minutes or until the broccoli is tender. Strain out the broccoli & almonds, but hold onto the liquid you cooked them in. 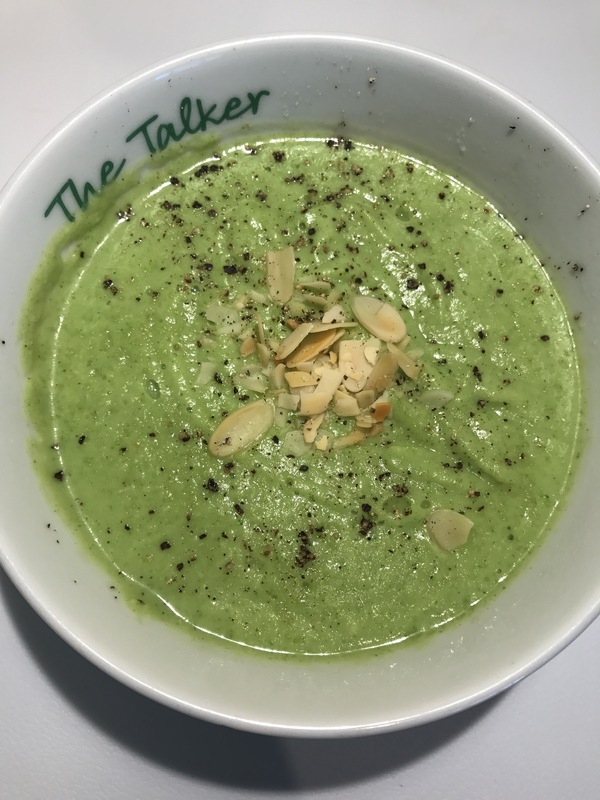 Put the broccoli and almonds into a high-speed blender (I use a Nutri bullet) and add a little of the liquid it was cooked in*. Blend for about 1 minute until smooth. * The amount of liquid you add to the blender depends on your desired consistency. For light soups add more liquid, if you want a thick and creamy soup, add less liquid.